Oliver Wendell Harrington (1912- 1995) was one of America’s most talented and influential political cartoonists in the decades between the Great Depression and the end of the Cold War. After leaving the United States during the McCarthy era, he became a key member of the African American expatriate community in Paris, and lived out his final years in East Germany. Harrington was born in New York City on February 14, 1912, the child of Herbert Harrington, a railroad porter, and the former Euzenie Turat, a recent immigrant from Austria-Hungary. Raised in an ethnically diverse neighborhood of the Bronx, Harrington’s childhood among a racially mixed family of limited means was challenging for himself and his four siblings. But from a very young age, he was an exceptional artist, and able to find solace by drawing satirical cartoons. The New York public school system, recognizing Harrington’s artistic talent but blinded by racial stereotypes of the day, sent him to a Manhattan vocational high school designed to prepare students for a career in the textile industry. Harrington accepted the education, but kept his sights on cartooning and the flourishing black culture of the Harlem Renaissance. After finishing his vocational training in 1931, he was able to enroll at the National Academy of Design in Manhattan. There, he refined his skills as an artist under the school’s accomplished faculty and earned a modest living as an actor, puppeteer, set designer, and cartoonist. it to “Bootsie” after its main character, an ordinary looking, somewhat corpulent resident of Harlem with a unique knack for revealing racial hypocrisy and irony wherever they were found. “Bootsie,” the first cartoon series by a black artist to break onto the national stage, cemented Harrington’s reputation. During this period, Harrington increasingly associated himself with fellow left-wing and, in some cases, communist New York journalists. He continued to sell political cartoons, and took a position as art instructor in the Works Progress Administration, the Roosevelt administration program that employed thousands of artists during the Great Depression. Connections he made at the WPA led to his admission to the prestigious School of Fine Arts at Yale, where Harrington paid his tuition by continuing to sell cartoons and by waiting on tables. At Yale, Harrington won several awards for his art but also complained that many opportunities eluded him due to racism. Harrington made an important connection in 1942 when Adam Clayton Powell, Jr., minister of the largest church in Harlem and future congressman, named him art editor of the new Harlem newspaper, People’s Voice. Harrington created a new comic strip for the Voice called “Live Gray.” The following year, he became war correspondent for Robert Lee Vann’s Pittsburgh Courier, one of the largest African American newspapers in the country. 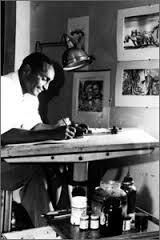 In Europe, as a reporter and political cartoonist, Harrington covered black units such as the Tuskegee airmen. He also entered into the first of three marriages, this one barely outlasting the war. By 1952, it was clear to Harrington that he was walking straight into the teeth of the national crusade led by Senator Joseph McCarthy against left-wing activists. After he, himself, was questioned by the FBI over biting cartoons he had produced about the continued existence of lynching in the United States, and when one after another of his friends and associates was prosecuted or blacklisted, Harrington decided to leave the United States. Arriving in Paris, France, he became an important member of a community of expatriate black artists that included writers Richard Wright and Chester Himes, and supported himself, barely, by continuing to produce “Bootsie” for the Courier. Except for a second, equally brief marriage, and a short stint in England, Harrington remained in Paris until 1959 when he was honored with an invitation from the Soviet humor magazine Krokodil to serve as visiting artist. His acceptance, in the midst of the Cold War, did nothing for his political reputation in the United States. with the establishment of the Oliver Wendell Harrington Cartoon Art Collection at the Walter O. Evans Collection of African American Art in Savannah, Georgia.